Quinn Villa is an executive 4 Bedroom/3Bathroom Home and is beautifully furnished to a very high specification. One of only a few homes in the �Premium Plus� range! Upgrades include wooden flooring throughout downstairs and the staircase, granite worktops in the kitchen and classy wooden window shutters throughout. Quinn Villa is very spacious & comfortably sleeps 8 people. Our home consists of 4 Bedrooms � One King Size with ensuite & Jacuzzi, two Double Bedrooms (one with ensuite) and one twin room (two single beds)all of which all contain flat Screen TV�s with Cable, there is also a further family bathroom. Our home offers a superbly equipped modern kitchen with breakfast bar, large fridge/freezer/ ice maker, oven & hob surrounded with Granite worktops. Our dining area and living room are furnished to an executive standard and include Flat Screen TV, Hi fi & games console/DVD Player with a selection of games and DVD's. Our home is also equipped with free access to Wi-Fi . You will also find a Washing Machine/Dryer within our Home. Fully air-conditioned throughout. To make your holiday as comfortable & straightforward as we can for you will find a Sat Nav inside our home for you to use during your stay. For those of you who have babies you will find a high chair,travel cot, sterilising unit and bottle warmer within our home for your use. Basically all you need to bring is yourself, your family and your clothes everything else is here waiting for your dream Florida holiday to begin! 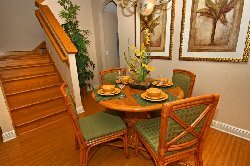 Our home is situated in the quieter area of the Regal Palms Complex. 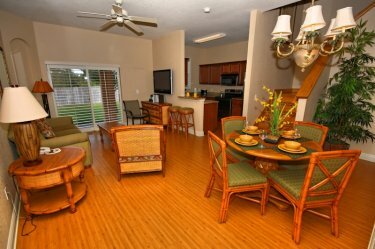 Regal Palms is a perfect choice for families! 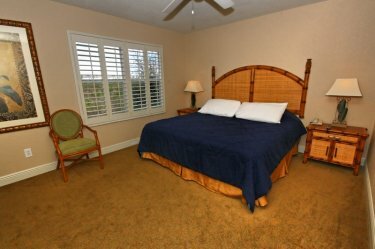 Regal Palms Report & Spa is Located in Davenport just a 15 minute drive to Disney's Magic Kingdom and surrounding attractions and within a 20 minute drive to Universal Studios, SeaWorld and Aquatica. 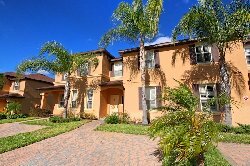 Quinn Villa is situated in a perfect location for your Florida Holiday! Regal Palms is a private Gated resort which can only be entered via the use of electronic key cards, all facilities on Regal Palms are solely for residents use only. Regal Palms offers excellent facilities for the 'down time' between all your 'park hopping' boasting a 2 acre waterpark (opening times 8am-11pm) consisting of two large pools, lazy river & waterslide surrounded by sunbeds to relax and top up your tan whilst enjoying a drink from the poolside Tiki bar. The restaurant is open for breakfast, lunch and dinner and those in between snacks! Alternatively you can take a dip in the bubbly hot tub. There is also a children's play area, gift shop & volleyball court. The Berry Centre is only a short walk away where you will find a Publixupermarket, Chemist and Resturant. Highland Reserve Golf Club is only 5 minutes from Resort. 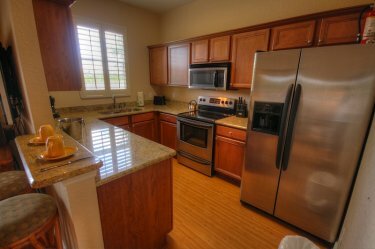 Regal Palms is just off the I27 which is ideal for all your Disney trips and a direct route from either Orlando or Sanford Airport. We would of course supply you with full directions from the airport to our Home. 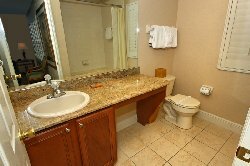 Close to Universal Studios, Seaworld, Epcot Centre, Blizzard Beach, Legoland and of course Magic Kingdom. Within an hours drive you can easily visit the beautiful Florida coast. 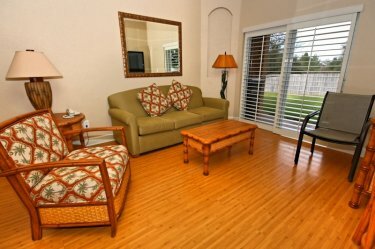 Our Prices for a 7 night stay at our Home includes the per day Regal Palms Resort Fee and Florida Taxes.